Defendant denies plaintiff's claim to title by adverse possession and by way of counterclaim seeks to enjoin plaintiff and members of his family from entering defendant's property. Trial was held on February 9, 1982. A stenographer was sworn to record and transcribe the testimony in the case. Four witnesses testified and seventeen exhibits were introduced into evidence and are incorporated herein for the purpose of any appeal. 1. By deed dated December 26, 1922 and recorded in Book 1542, Page 288, [Note 2] Mary E. and Lillian A. Calder conveyed a tract of land including the strip of land in question on Neponset Street in Norwood, Massachusetts, to Massimo Simoni, Albert Simoni and Albert Bonfatti. 2. By deed dated June 29, 1926 and recorded in Book 1702, Page 117, Albert Bonfatti conveyed his 1/3 interest in the Neponset Street land to Gateano Simoni. 3. By deed dated August 10, 1928 and recorded in Book 1808, Page 252, Gateano Simoni conveyed his 1/3 interest to Massimo Simoni and Albert Simoni. 4. By deed dated May 9, 1944 and recorded in Book 2486, Page 71, Massimo Simoni conveyed his 1/2 interest to Albert Simoni thus making Albert Simoni the record owner of the entire tract. 5. Albert Simoni, Jr. testified that from 1946 until 1955 a florist business known as Simoni's Flowers, a partnership consisting of his brothers, Robert and Andrew, and himself, was operated on the land. Some time during 1947 the Simoni's Flowers partnership leased the land from their father, Albert Simoni. This lease itself was placed in a safe that has been stolen, and neither it nor copies of it are available to be put into evidence. 6. In 1955, the Simoni's Flowers partnership became incorporated and began doing business under the name of Simoni's Flowers, Inc. The president of the corporation was Andrew Simoni and the treasurer Albert Simoni, Jr., both brothers of the plaintiff. Plaintiff has himself been a part time employee of Simoni's Flowers, Inc. for over 30 years. 7. On April 1, 1955, the father Albert Simoni died testate leaving his widow Marie Simoni, four sons, Andrew, Albert E. Jr., Robert, and Ralph, and four daughters; Madeline, Dorothy, Marjorie and Katherine. At the time of his death, Albert Simoni owned the tract of land on Neponset Street in Norwood, Massachusetts which passed to his wife under his will. She was also his executrix. 8. In 1955 plaintiff spoke with his mother and told her he wanted to purchase a piece of property on which to build a house. Shesaid to "take all he wanted and have it surveyed", which plaintiff did. 9. By deed dated November 18, 1955 and recorded in Book 3426, Page 163, Marie E. Simoni, executrix of the will of Albert Simoni, conveyed the lot that plaintiff had had surveyed to him. It contained 24,623 square feet, is numbered 88 Neponset Street and is shown in part on Appendix A. The strip of land in question was not included in this deed but is located to the south thereof. 11. Albert Simoni, Jr. testified that one day during 1956 when his brother, the plaintiff, came to work the latter asked him for permission to use the strip of land for a garden and badminton court. Albert testified that he replied, "sure, use them as much as you want to, I have no particular use for that particular land at the present time". Plaintiff also asked his brother if he could borrow a Simoni's Flowers, Inc. tractor, plow and harrow to prepare the land. Albert Simoni gave him permission to use the equipment and testified that over the years he never objected to plaintiff's use of this strip of land. 12. Plaintiff testified that he did ask permission to borrow the tractor and other implements from Simoni's Flowers, Inc. but that he never asked for nor was he given permission to use the strip of land. 13. By lease dated February 1, 1961, plaintiff's mother Marie E. Simoni leased her land containing approximately 26 acres and including the strip in question located on Neponset Street, Norwood, Massachusetts to Simoni's Flowers, Inc. This lease did not include Marie's house nor of course the land owned by Ralph. 14. 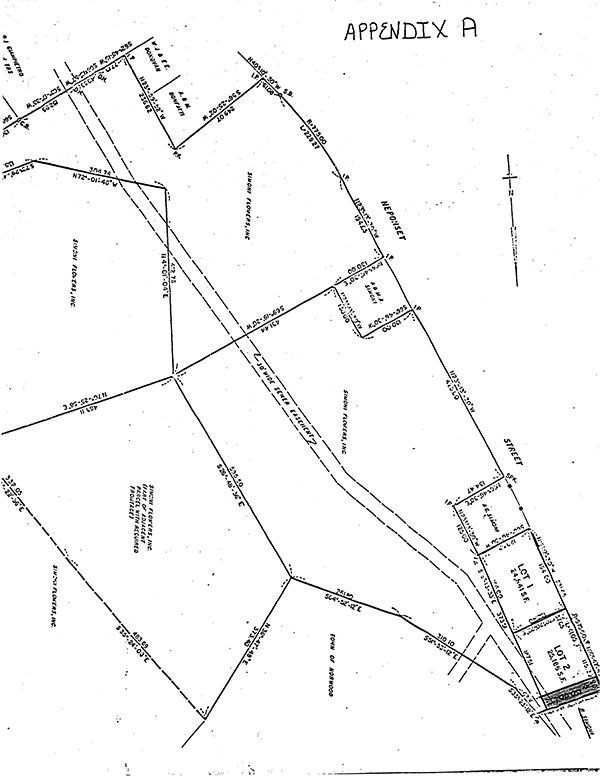 On February 1, 1963 Marie E. Simoni and Simoni's Flowers, Inc. re-executed the lease for the Neponset Street land this time excluding two vacant house lots as well as plaintiff Ralph's and Marie's house lots. 15. On September 6, 1969 Marie E. Simoni died testate naming her sons Albert E. Simoni, Jr. and Andrew E. Simoni co-executors. 16. By deed dated January 26, 1972 and recorded in Book 4811, Page 384, Albert E. Simoni, Jr. and Andrew E. Simoni, co-executors under the will of Marie E. Simoni conveyed the premises leased by Simoni's Flowers, Inc. to said Simoni's Flowers, Inc.
17. By deed dated June 18, 1980 and recorded in Book 5832, Page 436, Simoni's Flowers, Inc. conveyed Lot 2 to defendant Steven Simoni (See Appendix A). Said Lot 2 contains the so-called strip, title to which is claimed by Ralph Simoni by adverse possession. 18. By letter dated September 4, 1980, Attorneys Newman and Newman, P.C. sent a letter (Exhibit 17) to Steven A. Simoni claiming that Ralph E. Simoni, had a 130 foot by 80 foot easement over Steven Simoni's property. 19. By letter dated January 15, 1981 Steven A. Simoni sent Ralph E. Simoni a letter stating "I hereby give you formal notice that any and all licenses, rights and permissions heretofore granted to you are hereby revoked. . ."
The sole question to be determined here is whether or not plaintiff has acquired title to the strip by adverse possession. The Court finds and rules that he has not. In order to establish title by adverse possession there must be proof of nonpermissive use which is actual, open, notorious, exclusive and adverse for a period of more than twenty years. Kershaw v. Zecchini, 342 Mass. 318 (1961), Ryan v. Stavros, 348 Mass. 251 (1964). One who claims title by adverse possession must prove every element of his claim and if any element is left in doubt the claimant cannot prevail. Mendonca v. Cities Service Oil, Co., 354 Mass. 323 , at 326 (1968). Applying these principles to the instant case it is apparent that plaintiff has failed to sustain his burden of proof. It has been long established that if an owner expressly consents to the use of his property, the permissive user may not successfully assert title by adverse possession. Ryan v. Stavros, supra at 263, (1964). The plaintiff has not shown that his use of the strip was adverse. The area in question was part of a large area held by the Simoni father first, and later by three of his sons for the florist business. The family lived on the area and as the sons grew, certain areas were set aside for them to build houses on. Although plaintiff was not directly connected with the management of the business, he worked part time at it and for his brothers. It continued to be a family enterprise up to the present time with the family being friendly. There was evidence that the strip of land used by plaintiff was used with the knowledge of the rest of the family. In fact, plaintiff on several occasions had picnics and outings on this strip shared in by his brothers and their families. The plaintiff raised vegetables in his garden which he shared with other family members. Ralph Simoni admitted that he had asked permission to use the Simoni's Flowers, Inc.'s tractor, plow and harrow to prepare this strip of land for his use back in 1956 and that his brother Albert gave his permission. Plaintiff used the same equipment from time to time in later years for work on the strip. Albert testified that at the time he was asked permission to use the equipment he was also asked permission to use the strip of land and that he gave permission because the land was not then needed for use in the florist business. There was no indication of any sort that the plaintiff was seeking to use this strip of land adversely to the family. Rather, he used it as a part of the family, allowing them to enjoy it with him. Although the testimony is at variance, the Court finds that plaintiff did receive permission to use the disputed strip of land from his brother Albert who had the authority to give permission for Simoni's Flowers, Inc., and that tacit permission was given by the rest of the family. It was not until 1980 that the plaintiff gave any indication that his use of the strip was anything but permissive. It was only in 1980 that such a claim was made when the strip involved was needed for a house lot for family member Steven Simoni. The Court rules that plaintiff's use of the strip of land in question was permissive rather than adverse. [Note 1] Appendix A is a copy of exhibit 9 which is a plan of land in Norwood, Massachusetts date February 21, 1979 and filed as Plan Book 280 to which the Court has added certain annotations. [Note 2] All references to instruments are to instruments located in the Norfolk Registry of Deeds, unless otherwise indicated.